Are you cooperating with any particular tea school? I have the cooperation of 16th Grandmaster Ueda Sōkei and his successor, Ueda Sōkō, to make an English translation of “Question and Answer with Oribe - notes from a student of chanoyu in the early Edo Period”. I have the Ueda Sōko School's consultation during the translation and assistance with the future publication when the translated manuscript is complete. Why have you chosen these manuscripts to translate? I have chosen the other two manuscripts to translate in conjunction with ‘Q&A with Oribe' to give a comprehensive context to the material, as they intertwine and each deepen the understanding of the other texts. I believe this approach will provide patrons with a broad, continued study of the formative texts of chanoyu. Are these texts relevant to modern day practice? Yes. These texts are referenced for teaching the Ueda Sōko Ryū and have influenced the modern day practice of this warrior tea school. As a teacher of this school, I, too, reference these historical manuscripts when teaching my students and to inform my own practice. As there were no formal schools of tea at the time these texts were written, the relevance of these texts extends to other schools of chanoyu, especially warrior-class traditions. The contents of the texts for translation concern all schools that formed from the teachings circulating in the Momoyama and early Edo Periods. Most of the texts are in a literary style called 'sōrōbun'. Sōrōbun gets its name from the frequent use of the polite auxiliary verb 'sōrō'「候」 (meaning 'to be' in a formal, polite form). Sōrōbun writers like Furuta Oribe and Ueda Sōko made extensive use of Chinese characters and Chinese word order, often omitting Japanese particles and conjugational suffixes. Usually, the more recent the text, the more particles and conjugational suffixes are included in the text. This reduces the amount of complex decoding operations required to read the text as Japanese. Reference texts of similar nature that have a modern Japanese version accompanying the original sōrōbun text. There are quite a lot of these to reference in chanoyu literature. Even for the documents I am translating, in some cases there are modern Japanese versions created by acclaimed scholars such as Kumakura Isao. Reference other documents on chanoyu that discuss similar topics. After checking a range of sources such as chanoyu encyclopaedias and other old manuscripts of masters such as Rikyū, I am able to gain the confidence I need to commit a phrase to English. Ask fellow sensei at the Ueda Sōko Ryū. Ask my mates. The world of gaijin translating sōrōbun is a small one! After I translate my texts, I check the translation a second time, with fresh eyes. Then days later I proof read the translation for grammar, spelling and punctuation. After this process I share my translations with the public. Ideally, I would prefer to have another sōrōbun translator check my translations. I have a person lined up and I will engage this person to check my translations if I can achieve the required budget through Patreon. What is your view for publication? I will seek formal publication for the English manuscripts upon their completion. The Grandmaster of the Ueda Sōko School has confirmed the School's publishing house, Wafūbunko, is an option for publishing the Q&A with Oribe manuscript. I will also explore e-book format in the future. If successful, I will make these available first to my patrons. As I progress through the translations, I will first share them with my patrons, then at a later date I will make certain sections available to the public on various forums. For example, for teaching purposes (teaching my students), to answer questions on forums such as Chanoyu.Cloud, and on my public feed of Patreon. Part of my life's mission of "peace to the inner and outer world through chanoyu" is bringing the teachings, philosophy, historical and cultural insights contained in the old texts of chanoyu to a wider audience across the globe. I live off of teaching chanoyu to my students across the globe. I teach private and group lessons online and in person. Part of my teaching practice is creating and sharing an extensive library of chanoyu materials, both translated and of my own composition. I also film the temae of the Ueda Sōko Tradition for instructional purpose and make both free and student-only versions. I also work as an artist, largely in performance art, but teaching chanoyu is by far my main source of income. I chose this path of chanoyu and art after working as a project manager for the Victorian State Government until early 2015. My living is predictably meagre, but my passion is large. So many people need more tea! If you can choose to chip in a bit on my Patreon, I would be most grateful. What will you translate in the future? I intend to progress onto the other early-Edo period manuscripts discovered last century at the home of the Ueda Sōko School in Hiroshima. These documents elucidate Furuta Oribe and Ueda Sōko's style of chanoyu like never before. A list of these texts and others I am particularly interested in is below. The order in which I progress through texts will be decided in consultation with higher tier patrons. a. 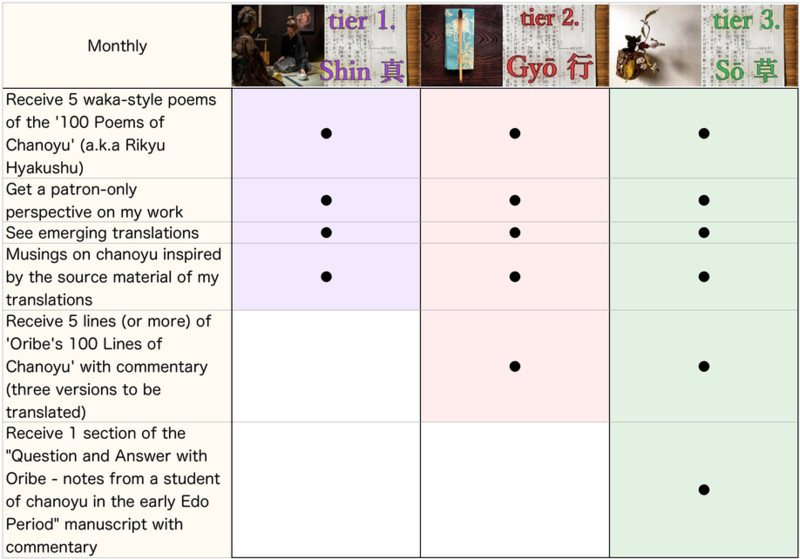 Comparative study of the 3 versions of Furuta Oribe's 100 Lines of Chanoyu (Japanese: 織部百ヶ条 Oribe Hyakkajyō) with the version accredited to Rikyū published entitled ‘Hundred Lines of Chanoyu’「茶湯百箇條目録」. b. Compare the discrepancies between the source text Learning from Furuta Oribe - notes from a student of chanoyu in the early Edo Period (茶道長問織答抄 Sadō Chōmon Shokutō Shō) and the copy made from it Kobori Enshū's notes from Furuta Oribe (宗甫公古織江御尋書 Sōho-kō Furuori e O-tazune Sho). This manuscript was accredited to Kobori Enshū until this original manuscript was discovered in the Ryukoku University Library. From the source text, it is clear the original author was Asano Yoshinaga. Following the comparative study of Learning from Furuta Oribe and Kobori Enshū's notes from Furuta Oribe, it would be enlightening to conduct dialogue with a member of Enshū Ryū to document the way both documents influence their School's practice of chanoyu. c. More topics will surely arise during the translation process.